Which of the United States' two biggest publicly traded water utilities makes for the best long-term investment? American Water Works (NYSE:AWK) and Aqua America (NYSE:WTR) are the largest and second-largest publicly traded water utilities operating in the United States, respectively. The two companies share a good number of similarities, including having growth strategies that place considerable importance on acquisitions and operating hydraulic fracturing -- or "fracking" -- water businesses that serve energy companies. Given their similarities, it can be challenging to tease out relevant differences in order to determine which of the two stocks looks most attractive as a long-term investment. That's our goal. Here's how the two companies stack up on some key metrics. Data sources: Yahoo! Finance and YCharts. Market capitalization = stock price x number of shares outstanding; EPS = earnings per share; YOY = year over year; TTM = trailing 12 months. *S&P 500's return is 23.4%; **S&P 500's total return is 101.6%. Data to Feb. 3. American Water has boatloads more cash and equivalents on its balance sheet than does Aqua America: $46 million versus $3.7 million, as of the end of the most recent (third) quarter. Granted, American Water needs more cash to run its business and pay its dividend, as it's the larger company. However, the difference in the two companies' cash piles is far greater than the difference in their sizes, no matter how size is measured. This advantage makes American Water better positioned to make acquisitions. The water utility industry in the U.S. is very fragmented, which means that there are many potential acquisition targets. This cash position advantage goes hand-in-hand with another big advantage related to acquisition potential: American Water's greater geographic diversity. It provides regulated water and wastewater services in 16 states, in addition to providing market-based services in another 31 states and Ontario, Canada. Aqua America, which also has market-based businesses, provides regulated services in just eight states. Thus, American Water has better potential for efficient expansion, as expanding near where it already operates results in economies of scale. American Water's revenue and earnings are growing faster than Aqua America's in 2016. More important, analysts estimate that it will grow EPS at an average annual rate of 7.5% over the next five years, whereas they peg Aqua America's five-year annual growth rate at 5%. As to valuation, American Water's trailing-12-month P/E and forward P/E are a little higher (less attractive) than Aqua America's. However, when we take American Water's significantly superior current and projected future earnings growth into account, it looks more attractive. Moreover, the company is much more attractive on a price-to-cash flow from operations (P/CFO) basis, with its 10.4 ratio versus Aqua America's 14.2. Neither company has a price-to-free cash flow ratio since both have negative FCFs. However, American Water has a much better record on this front in recent years. Aqua America's dividend is currently yielding 2.46% versus American Water's 2.07%. So it's a better stock for investors who are primarily or only concerned with current income. However, paying a higher dividend is usually a double-edged sword for a company, as it means that the company will have less cash available for other uses, such as acquisitions. Aqua America has the advantage when it comes to operating margins for the trailing 12 months: 40% versus American Water's 32.4%. Moreover, as is often the case, this advantage flows through to profit margins, with Aqua America's 26% margin leaving American's 14.2% all wet. Aqua America's margins have traditionally been the highest among water utilities operating in the U.S.
Aqua America comes out ahead on debt, too. Its debt-to-equity ratio at the end of the third quarter was 1.0 versus American Water's 1.3. 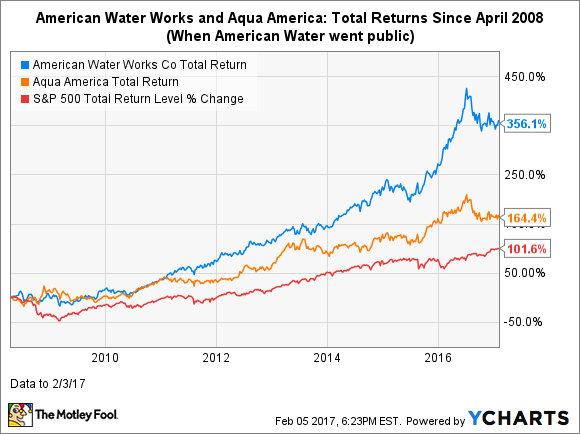 On nearly all metrics -- including the all-important cash on hand and projected future earnings growth -- American Water Works swims past Aqua America. I believe it has the better total capital appreciation potential (stock-price appreciation plus dividend). Moreover, while past performance isn't indicative of future performance, in my opinion long-term past performance does often reflect a company's sustainable competitive advantages and management's ability to set strategies and execute on them. American Water has significantly outperformed Aqua America over the long term, as per the preceding chart. Two related metrics to watch for American Water, however, are its free cash flow and its debt level. Investors should look for some progress there in 2017 and beyond.